Concrete Trends - Steve's U-Cart Concrete, Inc. While a concrete driveway is hardly a brand-new trend, there are several trends in the industry which can take your driveway from commonplace to contemporary. Stamped concrete is one of the hottest trends out there, and with good reason. This process allows you to create different patterns in freshly poured concrete. These designs can be fairly traditional, mimicking brick or stone. They can also be extremely customized, featuring whimsical stamps or even a family crest! When stamping is combined with color, you can really get creative with concrete. Colored concrete is available in many different shades, allowing you to create a stamped driveway which mimics red brick or river stone perfectly. While you can stamp a pattern into your entire driveway, front path or patio, you can also use dramatic stamps to create accents in the center or corner of any patch of concrete. This can be done in a driveway, a patio, or anywhere you want to add a touch of artistic visual appeal. Just be sure that your desired pattern won’t create a hazard for walking. While the same basic principle applies to patio surrounds as to driveways, many homeowners go a little wild and add exotic-looking accents to their pool or patio area. Since these areas are usually located behind the house, they’re not as visible from the street. Among the many unusual and beautiful stamped concrete options which have become popular for pool and patio areas include accent stamps, stamped concrete which mimics rock or stone, and stamped concrete which mimics hardwood flooring. While this last option may sound odd, the degree of realism which can be achieved by using stamps and stains is truly amazing. Wood flooring surrounding your pool or patio area may not be in harmony with your overall home d cor, but for many modern homes, it provides a strikingly unusual touch. While using concrete for the floors inside your home may sound odd, remember that today’s concrete does not have to be gray, rough and boring. A few trendy finishes can make a bold statement inside your home, and they’re suitable for many different rooms. Entry areas, living areas and kitchens are the most popular places for concrete flooring. Polished concrete has been used extensively in office buildings and other public areas, but only recently have homeowners begun exploring this beautiful and cost-effective option. Polished concrete is just what the name implies. Regular concrete is simply sanded, buffed and polished to a high, deep shine. If colored concrete is used, the d cor options are endless. 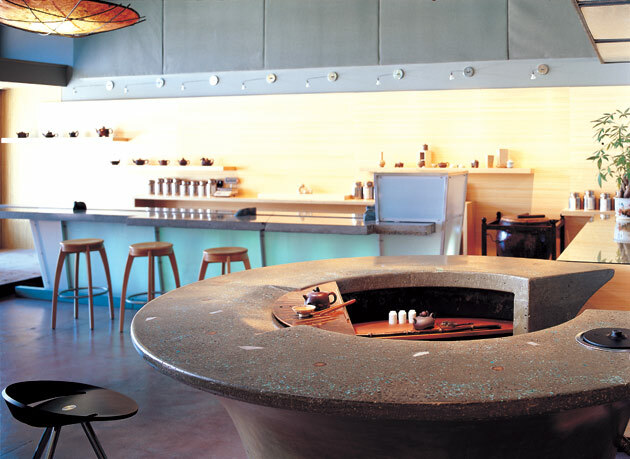 Scored concrete is another trendy interior option. In this technique, saws are used to make shallow cuts into the concrete. These cuts form patterns such as diamonds or triangles. Often, scoring is combined with colored concrete, and polished after the design is complete. This combination of treatments gives a finished result which looks remarkably like expensive stone flooring, at a much lower cost. Acid-washed concrete…that’s right, the same technique you loved on your jeans in the 1980’s is now popular for flooring! Acid-washing a floor is rather simple; a solution is applied to the floor along with metallic salts in your desired colors. When they react, these substances create a mottled, natural appearance which some homeowners feel is surprisingly close to marble. Combine a few colors which complement your d cor for a truly unique and stunning floor which ties your whole home together. A cost-effective option for homeowners who love the look of granite or other natural-stone countertops, concrete is becoming very popular for many reasons. In addition to saving money, a concrete countertop gives you a much broader range of color and style options than natural stone. It can be acid-washed, stamped, scored, and polished to create a look that’s unique to your home. Concrete, when properly sealed, is also nearly completely non-porous, freeing you from the worry of staining which comes with many natural stone products. If you’re considering concrete countertops, remember their weight. This may sound obvious, but many homeowners have been faced with a potentially hazardous and very expensive emergency project when their older cabinets sagged and cracked under the weight of new concrete countertops. You can avoid this mistake by having a professional assess your existing counter supports and replace them if necessary.